As School Psychologists, it becomes second nature to ensure that everything we do and write is legally defendable. 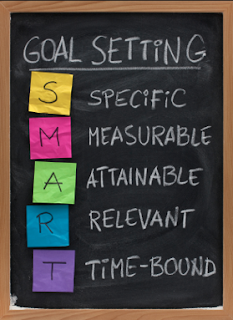 When that comes to IEP goals we want to make sure we are writing S.M.A.R.T. goals! 2) Measurable - You can count or observe it, basically you must use numbers and they must be meaningful. It is important that the baseline measurement is comparable to the goal measurement, this way we can see how much progress has been made in a year. 3) Attainable - It is best to write a goal you feel the child can and will achieve with the appropriate services and supports rather that to shoot too high. Remember, if the student exceeds expectations and meets their goal early, you should add new goal to continue on the progress already made. 4) Relevant - Although we often pull from a goal bank, it is important to modify and individualize your goals to address the unique needs and disability of that particular student. 5) Time-Bound - Start by considering the baseline and present levels of the student, then decide what exactly they need to be able to do after on year of special education. You should be able to progress monitor goals at regular intervals. I tend to write IEP goals that are behaviorally focused rather than goals specific to counseling sessions. I do this because I want to find out if the student is generalizing the skills learned in my groups into their daily routine and in multiple educational environments. I find that in order for school counseling to be successful, it should be paired with behavioral intervention to reinforce taught skills. I also make sure to support any behavior goal even if the student is not in counseling. I do this through daily collaboration and consultation with the Education Specialists on my team. While the teachers often track the classroom data for most of these goals, I aid in setting up class-wide and individualized behavior systems for all students in the programs I support. When given a task or direction ______ will begin the task within 1 minute and remain on task for a minimum of 10 minutes independently with no more than 2 prompts on 8 out of 10 independent tasks, as measured by staff data. Given a maximum of one verbal cue, _______will attend to a non-preferred, small-group activity and/or independent assignment, without protest, and remain on task with no task avoidance (bathroom, getting a jacket, tying shoes, sharpening pencil, etc.) for 20 minutes, in 3 out of 4 trials, as measured by observations and staff documentation. _______ will demonstrate on task-behavior in the general education setting for 75% of intervals during a 10 minute period, with the use of an appropriate fidget and one adult reminder, in 4/5 trials, as measured by observation and data. ________ will attend (sit still, eyes on teacher, hands to self, quiet voice) to a task during large and small group instruction across settings for a 10 minute period with no more then 1 teacher prompt in 4 out of 5 trials as measured by teacher charted data. With movement breaks and the use of self-regulation strategies, _____ will demonstrate the ability to attend to a task for an average 75% of intervals in a 20 minute class period. With the use of taught self-regulation strategies and self-monitoring checklists, ______ will independently begin a task (including non-preferred tasks) within 2 minutes of direction for an average of 80% of opportunities, across environments. With the use of taught self-regulation strategies and self-monitoring checklists, once ______ has began an independent task, he will then remain focused on the task for at least 10 minutes, free from adult prompts, for an average of 80% of opportunities, across environments. When given an assigned task, ____ will independently complete an assignment/task, and ask for assistance, if needed, with 80% accuracy in 5 out of 5 consecutive trials, in a small group setting, as measured by teacher-charted observations. When given a non-preferred task paired with the use of self-regulation strategies and rewards systems, ______ will begin the task within 1 minute, and complete the appropriately modified version of the task within a predesignated appropriate amount of time (with use of timer) on 8 out of 10 opportunities, as measured by staff data. _______ will demonstrate raising her hand to participate in whole class and/or small group instruction, 80% of the time in 5 out of 5 intervals, as measured by teacher observations. In the classroom environment, ______ will utilize positive self-talk and coping strategies to handle stressful situations or work demands in which he/she manifests anxious or withdrawn behavior (i.e. putting head down, saying he/she can't do something), demonstrated by engaging in the 30 minute activity or situation in a calm and positive manner with one prompt on 2/3 occasions. In counseling sessions, _______ will accurately identify feelings and appropriate coping strategies when presented with real or imagined situations with 80% accuracy on 4 out of 5 trials. When _____ becomes upset, frustrated, or angry, he will use a self-regulation/coping strategy (movement break, deep breathing, quiet space break, deep pressure/heavy work activity, etc.) to avoid engaging in an unexpected behavior, with one reminder, on 4 out of 5 opportunities, as measured by observations and documentation. ______ will improve insight on regulation as demonstrated by identifying the instances where he/she could have benefited from utilizing a tool to aid in regulation and determine what tool would have been beneficial for each instance with 80% accuracy. When presented with a problem (non-prefered task, frustrating situation, criticism/correction), ______ will accurately determine the size of the problem (big problem, little problem) and determine the appropriate emotional response (take a break, talk with teacher, take a deep breath, replace frustration with good thoughts, etc.) and return to task at hand in 4 out of 5 trials as measured by teacher charted data. When given a frustrating situation (i.e. undesired task, demand, and/or undesired peer behavior), with one prompt ________ will utilize coping strategies (i.e. take a break, deep breaths, etc.) and return to and remain on task with a calm body and mind for a minimum of 10 minutes with an average of 95% over 8 consecutive school weeks, across all classroom environments. When presented with a situation known by ______ to be anxiety or frustration producing for him (i.e. non-prefered task, unexpected obstacle such as ______, tasks perceived as too difficult, unfamiliar adult, and non-preferred adult), he will independently demonstrate an appropriate emotional response through finding a solution to his problem or using a strategy to regulate back to an expected emotional state (take a break, talk with teacher, etc.) and return to task at hand within 2 minutes, for an average of 80% of instances both throughout all environments and within each environment. _______ will show self-control of his/her body and voice (good personal space, keeping hands/arms/legs near body, and appropriate voice level) in relation to the expected levels of the classroom and peers around him for 80% of a 20 minute period. ________ will demonstrate self-control in the classroom through raising his/her hand and waiting to be called on by the teacher when he/she has a question in class, with 80% accuracy in 5 out of 5 trials, as measured by teacher observation and data collection. _______ will demonstrate the ability to recognize expected and unexpected behaviors as well as rate his own behavior as part of his self-monitoring system with 80% accuracy as compared to teacher ratings of behavior. ______ will demonstrate the ability to accurately recognize her level of anxiety through the use of a visual self-rating system (e.g. feelings thermometer) with 80% accuracy, as compared to teacher observations and data. _________ will refrain from physical aggression (i.e. kicking, hitting, pushing, tripping) across all environments in school, for 4 consecutive weeks, with all adults and children as measured by event data. _________ will refrain from aggression (i.e. hitting, kicking, pushing) 100% of the day, across all environments, with all adults and children as measured by special education event data, over 8 consecutive weeks. In counseling sessions, _____ will accurately identify situations that can be anxiety producing and appropriate coping strategies or relaxation techniques when presented with real or imagined situations with 80% accuracy on 4 out of 5 trials. With the use of Cognitive Behavioral Intervention (strategy of learning to regulate thoughts and beliefs in counseling paired with daily reinforcement as tools are utilized), _____ will reduce instances of negative comments and gestures to an average of 1 instance per hour, across all classroom settings, as measured over 6 trial days. When given a frustrating situation (i.e. non-preferred task, not being able to choose preferred activity such as computers, etc) _______ will engage in no more than 20 minutes of non-compliance over a week period as measured through time sampling data. Given a three step functional direction from an adult, _____ will complete all three steps with a maximum of 1 additional prompt in 4 out of 5 trials as measured by teacher observation and data. Through the use of Self-Monitoring checklists, _______ will reduce instances of Passive Non-Compliance (becomes purposely and increasingly distracted through ignoring tasks, demands, or staff directives) to an average of 20% of intervals or less, both across all educational environments and within each educational environment, as measured across a one week period. During a 20 academic task, ____ will respond to staff directives in an expected manner within 1 minute and with one reminder on 4 out of 5 trials, as measured by teacher observation and data. _______ will decrease inappropriate verbal comments (such as "you are weird" or "you are a loser") to 1 time per week or less by responding appropriately when his/her feelings are hurt (use words, talk to a teacher, walk away, stay calm) and seeking attention in appropriate ways (asking a friend to play, initiating conversation, giving a compliment) in 4 out of 5 trials as measured by teacher charted data. During unstructured play (recess, choice time), _______will play (participate, share, follow directions/rules, take turns) with 1-2 peers for 10 minutes with no more then 1 adult prompt in 4 out of 5 opportunities as measured by teacher/staff data and observation. When given scenarios of social conflicts, ______ will demonstrate problem solving skills by identifying the problem and generating two solutions appropriate to the situation in 4/5 trials, as measured by data collection. _____ will organize his/her materials in a binder or folder and will bring assignments to and from school with 80% accuracy as measured by binder/agenda checks and teacher records. _______ will organize his/her materials in a binder or folder and will bring assignments to and from school with 80% accuracy as measured by binder/agenda checks and teacher records. Given helpful organizational strategies, _____ will present with organized school materials (folders, books, assignments, supplies) in his desk 3/4 times, 3 weeks in a row, as measured by review of his student planner, timely completion of assignments, and teacher report. _______ will independently perform the task of writing his HW legibly in his planner and compile needed assignments in his binder with 80% accuracy in 5 out of 5 consecutive trials as measured by teacher-charted observations/ planner checks. Long Term Goal: Student will produce the // speech sound with 90% mastery. 1. S. will produce // in isolation with 90% accuracy. 2. S. will produce // in syllables with 90% accuracy. 3. S. will produce // in all positions of words with 90% accuracy. 4. S. will produce // in sentences with 90% accuracy. 5. S. will produce // in oral reading tasks with 90% accuracy. 6. S. will produce // in structured conversation with 90% accuracy. 7. S. will produce // in spontaneous speech with 90% accuracy. 8. S. will improve self-monitoring skills for the target sound // with 90% accuracy. 9. S. will improve carry-over of the target sound // outside of the therapy setting with 90% accuracy. X will produce intelligible utterances in “Subject-Verb-Object” sentence forms. Firstname will work towards increased intelligibility by decreasing his rate of speech during all tasks and increasing his loudness level given less than 2 verbal cues per interaction. Firstname will use correct sequencing of syllables during multisyllabic word production in 3 out of 4 trials. Firstname will apply targeted speech intelligibility skills across educational and social settings. Improve strength of oral musculature with lingual-labial exercises. Improve correct sound production of (*fill in target sounds) during structured speech exercises. Improve ability to utilize and self monitor exaggerated articulatory posture. Improve ability to maintain slow speech rate with intermittent pausing. To increase diadochokinetic rate to normal limits. Generalize improved articulation skills across educational and social settings. Demonstrate production of / / with 80% accuracy over 3 out of 4 trials with __ cues or less. Identify presence of target sound in speech with 80% accuracy over 3 out of 4 trials with 2 cues or less. Discriminate between correct and incorrect production of the target sound with 80% accuracy over 3 out of 4 trials with 2 cues or less. Produce target sound in a variety of consonant – vowel combinations with 80% accuracy over 3 out of 4 trials with __ cues or less. Produce target sound in ____ position of words with 80% accuracy over 3 out of 4 trials with __ cues or less. Produce target sound in blends and consonant clusters with 80% accuracy over 3 out of 4 trials with __ cues or less. Produce target sound in structured sentences with 80% accuracy over 3 out of 4 trials with __ cues or less. Produce target sound in structured conversation with 80% accuracy over 3 out of 4 trials with __ cues or less. I. “Student” will address non-fluent speech in therapy with Van Riper symptomatic techniques. II. “Student” will demonstrate increased control of fluency throughout the academic day. III. “Student” will demonstrate increased awareness and control of rate of speech and intelligibility throughout the day. F7. “Student” will independently identify rates of speech (too fast, just right) with 90% accuracy. F8. Given an oral cue, “Student” will identify proper intonation and breath patterns by chunking phrases with 80% accuracy. F9. “Student” will independently identify episodes of nonfluency with 80% accuracy. Firstname will demonstrate the ability to identify and relax points of tension in the speech musculature. Apply targeted fluency awareness techniques across educational and social settings. 2. Develop a hierarchy of speech situations, relative to people, activities, and settings from least to most stressful. 4. Apply targeted fluency awareness techniques across educational and social settings. 2. Use of fluent speech during low stress situations. 3. Use of fluent speech during high stress situations. 4. Use of fluent speech when conversing with a friend or teacher. 6. Apply targeted fluency awareness techniques across educational and social settings. S. will match 10 identical symbols given a choice of 4 in a functional context such as cooking, in 8 of 10 opportunities. S. will match 10 symbols to objects given a choice of 4 in a functional context such as cooking, in 8 of 10 opportunities. S. will point to or get named symbols and objects from a choice of 6 when used in language games, cooking activities, and other classroom routines, in 8 of 10 opportunities. S. will point to a "same" or "different" symbol to indicate if pairs of thematic symbols or items are same or different, in 8 of 10 opportunities. S. will sort 10 items into 2 dissimilar categories, in 8 of 10 opportunities. S. will make 10 choices of preferred items from an array of 3 during snack by picking up a symbol or photo to an adult, in 8 of 10 opportunities. S. will initiate his turn during snack and Circle by pressing a voice-output switch, reaching toward the adult, and/or vocalizing, in 4 of 5 opportunities. S. will follow verbal directions to "sit, stand, give, go" during daily routines and transitions, with no more than 1 prompt, in 4 of 5 opportunities. S. will identify a named symbol, photo, or object by touching or selecting it from a choice of 3 during Circle (story, song, weather), attendance, schedule, language games, etc., in 4 of 5 opportunities. S. will demonstrate understanding of symbols by performing an action or going to the appropriate place when shown a symbol related to daily routines, in 8 of 10 opportunities. S. will act upon named/described elements in 2-part directions with no more than one repetition of directions, in 8 of 10 opportunities. S. will perform specific actions (including colors, prepositions, and drawing/coloring) in 2-part directions with no more than one repetition of directions, in 8 of 10 opportunities. S. will name items from an array of 25 symbols when given verbal clues describing appearance, function, or other features, in 8 of 10 opportunities. S. will answer the teacher's direct questions accurately (ie, answer "who" with a person, "where" with a place, "when" with a time word/phrase) with no more than one repetition of the question, in 8 of 10 opportunities. S. will recall 10 details from a story he has just read/heard, including characters, action, cause/effect, and sequence, by circling the correct symbol from a choice of 3, with no more than one repetition of the question, in 8 of 10 opportunities. S. will manipulate items correctly when given verbal directions that contain 1-2 objects and a preposition with no more than one repetition of directions, in 8 of 10 opportunities. After repeated exposure to 25 thematic symbols throughout one month, S. will name 80% of the symbols. After repeated exposure to 25 thematic symbols throughout one month, S. will point to 80% of the symbols when named, given an array of 8 symbols at a time. S.will perform 3 consecutive 1-step directions in order with no more than one repetition of directions, in 8 of 10 opportunities. Given a verbal label of a category, S. will name 3 items that belong to that category, in 8 of 10 opportunities. When a list of 3 items within a category are read to him, S. will name the category or unifying feature, in 8 of 10 opportunities. S. will repeat a sentence of 4-8 words after hearing it once, with no more than one error, in 8 of 10 opportunities. L1. “Student” will formulate single or multiple sentences on a given topic or using given words, with appropriate and clear meaning and increasing accuracy. L3. ”Student” will demonstrate knowledge of orally sequencing stories, using varied transitional language, given visual cues in 4 out of 5 trials. L4. “Student” will produce an oral narrative (including the characters, setting, goals, problem, and solution) using appropriate temporal language and varied transition words in 4 out of 5 opportunities. L5. Given instruction and moderate cueing, “Student” will formulate grammatically correct, detailed sentences in speech and/or writing with 70% accuracy. L6. “Student” will form syntactically correct sentences using conjunctions with 80% accuracy. L7. “Student” will correctly use irregular forms of plurals and past tense verbs with 80% accuracy. L8. “Student” will communicate using 4-5 words per sentence during 80% of utterances. L9. “Student” will ask and answer “why” and “how” questions. L10. “Student” will develop and utilize associative thinking skills, with improved semantics, through defining, describing, and comparison / contrast, 80% accuracy, with minimal cueing. L12. Given instruction, “Student” will improve understanding of ‘when’ and ‘why’ questions in response to an orally presented narrative with 1-3 clinician cues. L13. “Student” will describe and compare items, events and other topics with increasing clarity of thought, such that peers and adults understand the description, in 9 out of 10 opportunities. L14. Given instruction, “Student” will demonstrate improved verbal expression by defining terms, describing, comparing and contrasting items, events, etc., 80% accuracy, with minimal prompts. L15. During language activities, “Student” will follow up to a 3 step direction that incorporates age appropriate linguistic concepts (temporal, sequence, location) when provided with 3-5 clinician cues. _____will identify and sort picture cards into appropriate catagories with 75% accuracy in three out of four observable opportunities as measured over nine weeks. S. Will respond to teacher directed questions by touching an appropriate symbol on the display of a voice output communication aid when a visual cue or gesture prompt is provided in 3 out of 4 opportunities over 3 consecutive sessions. S. Communicate using combinations of two or more words or understandable representations (e.g. word approximations, picture symbols, signs) with _% accuracy over 3 out of 4 trials. S. Participate verbally in structured language activities by answering “wh” type questions related to on going events with _ % accuracy in 2 out of 3 trials over 3 consecutive sessions. S. will demonstrate appropriate attention to person/task by looking briefly at person requesting attention on first command in a one – to – one situation with 80% accuracy over 3 out of 4 trials with 1 cue after initial request. Follow auditory directions of increasing length and complexity. Understand and answer questions with background noise present. Remember & repeat order of spoken words in a series accurately. Combining isolated sounds together to form words. Apply targeted auditory discrimination skills across educational and social settings. Identify and/or match same sounds in words. Recognize and/or produce rhyming words. Apply targeted speech and language skills across educational and social settings. Long Term Goal 1: Student will demonstrate appropriate use of conversational manners. 1. Student will maintain conversations by staying on topic and/or making appropriate topic transitions for up to 6 exchanges with both peers and adults in 4/5 opportunities. 2. Student will demonstrate appropriate turn-taking in conversations given a verbal cue and/or visual prompt with 90% accuracy. 3. Student will demonstrate understanding and use of appropriate tone of voice and volume with 90% accuracy given role-playing and situational cues. Long Term Goal 2: Student will demonstrate understanding and use of a variety of strategies for effective comprehension and expression of language in social situations with 90% accuracy. 1. Student will correctly identify and label emotions and related non-verbal, tone of voice and situational cues using role play and videos in 8/10 trials. 2. Student will demonstrate the correct use of at least 5 relaxation techniques given situational and role-playing clues with 90% accuracy. Demonstrate the ability to create (selecting relevant criteria) preparatory tools (i.e., spread sheets, bullets, flow charts) to facilitate natural speech (formulate a conversation and remain on task). Demonstrate the ability to repair communication breakdowns when expressing ideas (e.g., revision behaviors). Demonstrate the ability to incorporate new content area curriculum vocabulary and phrases in conversation. From a provided list of names of peers who are amenable to being contacted, the student will learn the steps and contingencies inherent in setting up/participating in a peer social interaction. Q1: 1:1 after-school planning with assistance. Q2: 1:1 after school planning independently. Q3: plan/execute group activity with assistance. Q4: Plan/execute group activity with minimal assistance. The student will demonstrate awareness of social cues and respond appropriately. Student will demonstrate 3 appropriate verbalizations during game play (i.e., simple board or bingo game) with at least one other peer. Student will imitate peer movements during group activities without an adult directive (i.e., line up, sit down, get a pencil). Given an orthographic cue student will demonstrate the ability to verbalize what she needs help with (i.e. “I need help with/to/for __________). Goal I. Given a structured social activity ”Student” will use language in an age appropriate manner to communicate with peers and teachers without conflict and with the opportunity to have all ideas conveyed accurately. Goal II. “Student” will understand and follow rules for expected behavior in the classroom environment. Goal III. “Student” will demonstrate modification of impulsiveness to interrupt, answer for others and not participate in turn taking. P1. “Student” will monitor the content of spoken language, remaining on topic for three conversational turns within a structured social language opportunity. P2. Given a visual cue, “Student” will identify instances where the conversation has strayed from a topic with 80% accuracy. P3. “Student” will initiate two conversations during one thirty minute structured inclusion setting with typical peers. P4. ”Student” will monitor eye contact, body language, and tone of voice during conversation. P5. “Student” will practice and utilize register shift during conversations with adults and peers with 80% accuracy. P6. “Student” will use novel statements to enter into play activities in two out of three opportunities when provided with faded models and/or cues. P7. “Student” will stay on topic while engaged in a conversation with one or more peers in two out of three language activities when provided with faded models and/or cues. P8. “Student” will engage in two novel topics of conversation with one or more peers when provided with faded models and/or cues. P9. “Student” will make requests using polite language (e.g., "Can you help me?") in two out of three language activities when provided with faded models and/or cues. P10. Given a class setting, “Student” will initiate interactions with another student in one activity throughout the day. P11. Given a class setting, “Student” will join a small group of students in one activity throughout the day. P12. “Student” will exhibit the pragmatic skills of active listening, commenting, asking questions, and appropriately entering and exiting conversations. P13. “Student” will ask a peer a question in 3 out of 5 opportunities following faded models and cues. P14. “Student” will respond to a peer's question or statement in 3 out of 4 opportunities maintaining focus on the question. P15. “Student” will utilize politeness markers (e.g. please, thank you, excuse me). P16. “Student” will change communication style depending on listener and situation. P17. “Student” will ask questions appropriate to the conversation or discussion. P18. “Student” will participate in discussions and role-plays to resolve difficult social situations (e.g. disagreements, assertiveness). P19. “Student” will ask for clarification when directions are unclear. P20. Given instruction, “Student” will take into perspective the conversational partner through using specific language during structured activities with fading cues. ___ will use his/her communication device to identify his/her: a) name b) address c) phone number will 70% accuracy. Using his/her communication device during unit studies, ___ will activate the target symbol given a verbal prompt (i.e., "show me the ___. ", point to the ___. ", "where is the ___.") with 2 or fewer cues/redirections. Goal: Student will use spoken words, low tech picture symbols or a voice output communication aid to communicate in classroom activities in 3 out of 4 opportunities. 1. Student will request a toy or activity by taking the single picture off her communication notebook and give it to her communication partner. 3. Student will respond to teacher directed questions by touching an appropriate symbol on the display of her voice output communication aid when a visual cue or gesture prompt is provided. Goal: Student will improve his/her communication and language skills by using a voice output communication device, sign/gesture, or word approximations to complete the following objects in his educational environment 70% of the time. 1. Student will participate in small group and language group with and without prompts. 3. Student will make choices for preferred activity (toys, songs, etc.) with and without prompts. 4. Student will identify/match an object from choice of two with and without prompts. 1-Student will carry device to various school locations with minimal prompting with 90% accuracy. 2-Student will independently navigate to "home" page using augmentative communication device with 90% accuracy. 3-Student will use device to participate in specials/mainstreamed activities at least 3 times per session with minimal prompting. 4-Student will use device to participate in calendar time when asked a question with 90% accuracy. 5-During times of outward frustration, student will use augmentative communication device to indicate "need a break" or "I don't like/no/I don't want" for undesired items of activities with minimal prompting with 80% accuracy. 6-Student will omment "my turn, your turn, finished" during social group time with prompting with 80% accuracy. 7-Student will independently request food/bathroom/help using augmentative communication device in classroom setting with 90% accuracy. Goal I. “Student” will communicate effectively with all those in the family, school and community. Goal II. “Student” will use a communication device to communicate during classroom routines. Goal III. “Student” will use a communication device to request, label, and comment and answer questions throughout the day and across environments. AAC2. “Student” will use a communication device to indicate a choice. AAC3. “Student” will use gaze to make choices between two objects. AAC4. The student will use facial expressions, vocalizations, gestures and body language to communicate. AAC5. “Student” will use an augmentative communication device to communicate with others. AAC6. “Student” will use an augmentative communication device to communicate cessation of activity. AAC7. “Student” will use utilize a mode of AAC to answer questions during large group language activities in 4 out of 5 opportunities. AAC8. “Student” will use utilize a mode of AAC to inform others regarding past events in 4 out of 5 opportunities. AAC9. When presented with an item, a visual of a carrier phrase and a direction, “Student” will describe items using an augmentative communication device in 4 out of 5 opportunities. AAC10. “Student” will engage up to 3 conversational turns including conversation starters with adults and peers using an augmentative communication device in 4 out of 5 opportunities. AAC11. “Student” will respond to social greetings from adults and peers within 5 seconds in 4/5 opportunities. AAC12. “Student” will respond to questions regarding personal information using an augmentative communication device in 3 out of 4 opportunities. AAC14. “Student” will use an augmentative communication device to repair a communication breakdown without teacher cueing at least one time during the school day. Given picture support and verbal cues, X will make requests and comments during a structured activity. Goal II. Given instruction, “Student” will develop auditory processing of verbal material and direction following skills such that in order to function adequately in the classroom with decreasing amounts of assistance. Goal III. Given instruction, “Student” will develop and utilize compensatory strategies and techniques regarding auditory processing and direction-following areas that will allow independent functioning within the classroom. Goal IV. Given instruction, “Student” will develop recall, auditory processing and direction following skills to make reasonable academic progress within the classroom. AP1. Given instruction, “Student” will utilize strategies to increase auditory processing skills (i.e. reauditorization, paraphrasing, requesting repetition / clarification, etc.) with increased independence and when provided with 1 - 3 therapist cues, in 7 out of 10 opportunities. AP2. Given instruction, “Student” will increase comprehension of "WH" questions (Who, What, When, Where, Why) within structured language activities, paragraphs, and short stories, with 1-3 therapist cues, in 7 out of 10 opportunities. AP3. Given instruction, “Student” will improve comprehension of basic concepts skills that are prerequisite to understanding simple directions, with 1-3 therapist cues, in 7 out of 10 opportunities. AP4. Given instruction, “Student” will improve processing of new concepts and directions that are presented verbally, in 7 out of 10 opportunities, with therapist's assistance. AP5. Given instruction, “Student” will develop techniques for consistent auditory attention in all instructional settings, with decreasing verbal and visual cues, in 8 out of 10 opportunities. AP6. Given instruction, “Student” will develop and improve auditory processing of verbally presented information (especially higher level ideas and abstract thought) and multi-step directions, with limited direct therapist and teacher-intervention, in 8 out of 10 opportunities. AP7. Given longer sentences, paragraphs, and short stories presented verbally, “Student” will identify the main idea, the most pertinent supporting details, and will develop inferential thinking, with visual and verbal cues, in 8 out of 10 opportunities. AP8. Given instruction, “Student” will expand receptive vocabulary and associative thinking; and will demonstrate improvement of overall processing by correctly responding to various questioning, in 8 out of 10 opportunities. AP9. Given instruction, “Student” will correctly discriminate similar-sounding words when presented in spontaneous speech, in 9 out of 10 opportunities. AP10. Given instruction, “Student” will develop auditory processing of verbally-presented information and ability to follow typical multi-step directions in order to make reasonable academic progress, with limited direct therapist and teacher-intervention, in 7 out of 10 opportunities. AP11. Given instruction, “Student” will retell verbally-presented material / directions, with 80% accuracy with limited assistance. AP12. Given instruction, “Student” will develop and improve focus and speech discrimination in all instructional settings, with decreasing verbal and visual cues, in 8 out of 10 opportunities. AP13. Given instruction, “Student” will process incoming verbal information, and will identify key information, pertinent supporting details, and inferential thinking, with decreasing visual and verbal cues, in 8 out of 10 opportunities. AP14. Given instruction, “Student” will utilize strategies to increase auditory processing and conceptualization skills (i.e. reauditorization, paraphrasing, requesting repetition / clarification, etc.) with increased independence and when provided with 1 - 3 clinician cues, in 7 out of 10 opportunities. AP15. Given instruction, “Student” will develop listening strategies in all academic settings to demonstrate improvement within the classroom. AP16. Given instruction, “Student” will strengthen speech sound discrimination skills, with increasing background noise, in 8 out of 10 opportunities, with decreasing teacher/therapist cueing. AP17. Given instruction, “Student” will develop auditory processing of incoming verbal information as demonstrated by increased comprehension of this information by correctly responding to pertinent questions, and restating key information in 7 out of 10 opportunities, with some teacher/therapist cueing. AP18 Given instruction, “Student” will follow 1-step complex or simple 2-step verbal directions, and correctly rephrase the key information contained, reworded, in 7 out of 10 opportunities, with decreasing teacher/therapist cueing and assistance. FGL1. “Student” will identify various types of figurative language encountered in text. FGL2. “Student” will identify and interpret the meanings of idioms, metaphors, similes, or proverbs. FGL3. “Student” will create similes and metaphors in a sentence or paragraph. FGL4. “Student” will make predictions and inferences based on available information and/or evidence. FGL5. Given instruction and support, “Student” will explain nonliteral and figurative language and infer the causes of a character’s behavior in novels. FGL6. “Student” will infer why characters in literature say, feel, and do the things they do. WL1. “Student” will produce an expanded and grammatical sentence containing designated parts of speech. WL 2. “Student” will vary sentence structure to enhance the meaning of sentences and paragraphs. WL 3. “Student” will produce expanded grammatical sentences that answer the 5 wh questions. WL 4. Given a graphic organizer, “Student” will produce a cohesive five paragraph essay that includes topic sentences, transitions, and conclusion.